A stealthy single-hookbait approach and a hunch about location saw Cliff Baker land his fourth UK 40-pounder. The fish, known as Half Lin, weighed in at 40lb 12oz and came from the main syndicate lake at Emperor Lakes in Devon. 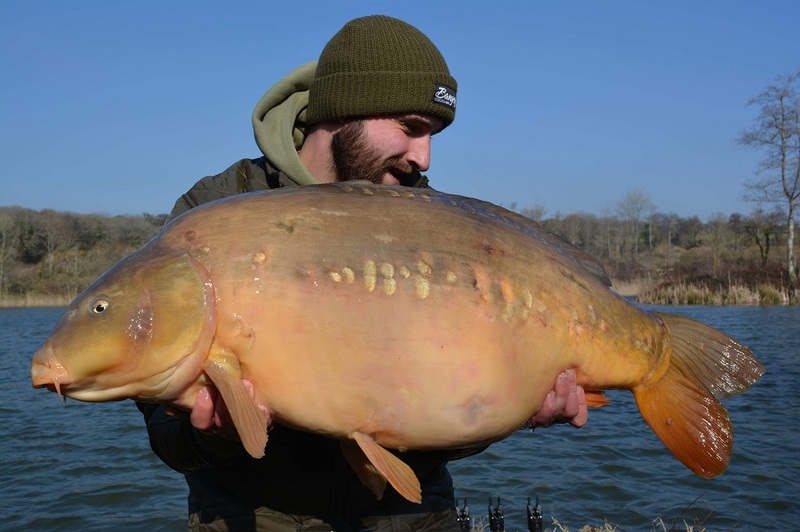 The 27-year-old told Carpfeed: “I targeted a deep area of the lake between three islands on a hunch I’ve had for a little while that that’s where the fish would be. “I decided to fish three naked chods on bright Nash Citruz pop-ups. I fanned my rods out around the deeper area and had them in place by 10am. “I was using small hooks, bright baits and little leads to cause as little disturbance as possible, hoping I’d land a bait on their heads. “By 3.30pm my left-hand rod was away. The bobbin pulled up, the rod bent round to the left and the fish stripped a bit of line and then just started to kite slowly left and back towards the bank. “As I hit into the fish I could feel the immense power and it started to run left ending up past my mate Steve Watkins, who was fishing to my left, and into the swim on his left known as Blue Boat. “I played the fish for the entire fight in Steve’s swim. It was a powerful, deep fight but eventually I managed after about 10 minutes to get her head up and Steve slipped the net under her. The fish is the Bristolian’s third 40 from Emperor.